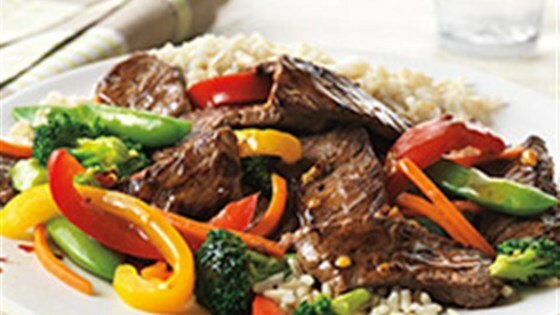 "The Asian Beef & Vegetable Stir-Fry is a delicious blend of savory flavors. Use lean beef to make this meal a quick and healthy option for any day of the week!" Hubby and kids enjoyed it - but a bit bland for me. Used red and orange bell peppers, snow peas, broccoli and carrots. May try a different stir fry sauce next time. This was really good! I used Kraft sesame ginger light salad dressing and more peanuts. My husband LOVED it! Hubby loved it ,so it's a keeper! So easy and I even used frozen stir fry veggies and it still was great! Dug out an old jar of sesame-ginger teriyaki sauce from the back of the fridge...it tasted perfect over rice! I was very good and easy. Used frozen veggies but I think I'll use fresh next time.